According to the Occupational Safety and Health Administration (OSHA), “slips, trips, and falls from heights” are high on the list of the 10 most common causes of workplace injury for electrical contractors and construction workers in the U.S., with thousands of accidents experienced every year. These injuries can have far-reaching effects, resulting not only in personal injury to the worker but lost productivity for the company. While falls can result in acute injuries, they’re not the only hazard associated with an electrical installation. OSHA confirms that a slow, silent, and often unseen source of pain and disability is poor ergonomics driven by the inefficient design of many electrical products and tools – to the tune of an estimated $15-$54 billion in annual medical costs for the range of musculoskeletal disorders they cause. Specifically, jobs which require electrical contractors to work in confined spaces/uncomfortable positions or to engage in awkward repetitive motions where they’re excessively reaching, exhibiting poor posture, or are off-balance can create safety hazards. In today’s cost-competitive business environment where speed and efficiency are imperative, the promotion of safety and productivity for electrical contractors and other qualified installers is paramount. That’s why Litetronics engineered a wide range of fixtures considering the industry’s most sound ergonomic and safety principles. Among those, Litetronics’ LED Magnetic Retrofits, a popular family of LED replacements for 2X2, 2X4, and 1X4 fluorescent troffer and strip fixtures, feature powerful rare earth magnets which secure the retrofit fixture to the existing housing, allowing for hands-free installation while working in the ceiling. A new generation of these retrofits also features an adjustable wattage driver for enhanced flexibility and ease of use. No more precarious balancing acts and frustrating tool-juggling antics while on tall ladders -- installers can enjoy a quick and easy assembly-line process when upgrading fluorescent technology to Litetronics’ LED Magnetic Retrofits. 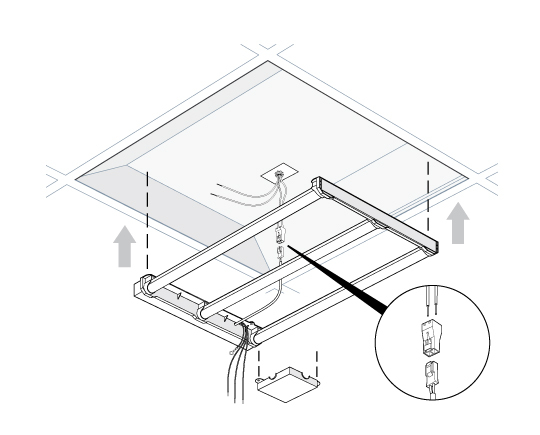 The fixture’s fully-integrated design further promotes safety and efficiency by eliminating the need for installers to break open the ceiling plenum, worry about asbestos contamination or removal, or assemble anything onsite.